The main street that ran through the village of Shelter was little more than a wide dirt path. The homes that ran along both sides of it were squat buildings with thatch roofs. The sound of people talking and the creaking of wood could be heard off in the distance. Nothing looked broken or ruined, but everything looked like it had been patched several times. Geralhd walked through the front door of the house where he was staying. It led into a small kitchen. Khita and Blacknail followed him. As Geralhd threw some water into a pot and lit a small fire in his stove, both his guests sat down at the table in the center of the room. “So you didn’t answer me before. Why are you here?” Geralhd asked after he joined them a few moments later. “You owe me more cheese. I don’t have any left,” Blacknail immediately told him. His voice was rather intense, because he was rather upset about it. “Come one in. I just put some water on for tea,” Geralhd replied after letting out a deep sigh. The young man then turned and gave Blacknail a meaningful look. “Be good,” he told the hobgoblin. “I’m always good. You humans are the ones who always mess things up. Do better,” Blacknail replied dismissively. As the leader, he was the only one that got to judge people’s performances. The front door then swung open and Tannin stepped inside. The bearded old man gave them all a polite nod of greeting. There was a friendly smile on his face and his eyes held a warm twinkle. Blacknail decided that this meant the old man wanted something. The hobgoblin was getting used to humans’ strange ways. Her angry words just caused Tannin to chuckle loudly and grin wider. He looked quite amused. “I take it that means you plan on staying out in the forest for a while longer?” he asked her playfully. “Yes, I do,” she replied in a chilly tone. “Yes,” Blacknail replied as he waited for his tea. He hoped it wasn’t the bitter kind. For now, Tannin had nothing the hobgoblin wanted, so talking to him wasn’t important. Geralhd got up and pulled out a chair for Tannin, and then they both sat down. The two made small talk for a few moments, and Blacknail fought the urge to close his eyes and take a nap. When was he going to get his tea? He tried glaring at Geralhd to get his point across, but the man ignored him. He wasn’t a very good minion. Blacknail was going to have to do something about that later. “Why don’t you ask for Blacknail’s help?” Khita suddenly asked. The use of his name caused Blacknail to focus back on what everyone was saying. He hadn’t been paying attention at all, so he had no idea what they were talking about. “Does he know a lot about goblins?” Tannin asked. Blacknail felt a small tingle of panic, but the man sounded friendly and curious. “I dare say, he is one of the utmost experts on the subject,” Geralhd replied with obvious amusement. “I suppose he must have run into a lot of them out in the wild Green,” Tannin mused aloud. Blacknail had been about to claim complete ignorance about goblins, but since Geralhd had spoken up, he decided to go along with it. This must an important conversation. Food was probably involved. “You’re having a problem with goblins?” Blacknail asked as he straightened up in his chair. Tannin sounded and looked like he wanted to hit something. He was holding one hand up and was clenching it tightly into a fist. This topic was obviously making him angry. Blacknail could use that. Tannin could probably be convinced to offer a tasty reward to anyone who solved his problem. As the old man continued to ramble on about spoiled grain, Blacknail heard a scratching noise from the far window. He looked out of the corner of his eye and noticed a green flash of movement. It was a goblin, a familiar one. Ferrar had caught up to them and was peeking in through the window. “That’s silly; goblins aren’t that smart,” Blacknail quickly agreed in a flat voice as he turned away from the goblin in the window and focused on Tannin’s face. He needed to focus on manipulating the foolish human. “There is nothing up my sleeves but my human arms, but I do know some tricks,” Blacknail replied carefully. He didn’t want to give himself away. Blacknail had just made that up, but it was the best he could come up with on short notice, and it even sounded like it could work. When Blacknail wanted to chase goblins away he simply gave them chores. He usually never saw them again after that. However, this idea didn’t appear to appease Tanin. The old man frowned and shook his head. He opened his mouth as if to speak but Khita cut him off. “Blacknail, you’re forgetting one obvious solution,” she interjected. “I am not,” Blacknail hissed at her. She was dumb. “You keep the wild goblins away by training other goblins to guard your stuff. Mr. Tannin could do the same thing. There is no reason he can’t.” Khita shot back. Blacknail grunted sourly. He hadn’t forgotten that. It was just a really stupid thing to bring up. Was she trying to expose his true identity and ruin his plans? Probably not, she was just stupid. “Guard goblins?” Tannin asked doubtfully. He didn’t seem sure if Khita was joking or not, but he clearly found the idea hilarious. There was an amused grin on his bearded face. “That’s what he does, and it works,” Khita replied defiantly. She then shrugged like she didn’t much care what he thought, even though it was obvious she did. As he turned towards Khita, Blacknail sighed and gave her an annoyed glare. Seriously? Why was she bringing this up? This idea was so dumb only a human could have thought of it. Tannin would never consider such a dumb plan. Under his hood, both of Blacknail’s eyes widened from surprise. Khita’s plan was so stupid it might actually work! He couldn’t waste this opportunity to take advantage of how weird humans were. Letting the humans get used to goblins would suit Blacknail’s purposes. It would also allow him to spy on the humans without concern, although apparently it wasn’t that hard. Even feral goblins could do it. Ferrar was still looking in through the window, and Blacknail had no doubt that he knew exactly what was going on. “How exactly do you train goblins?” Tannin asked. It sounded like he was seriously considering the idea. “Mostly you just hit them a lot and offer them food. They only get into trouble if they get hungry,” Blacknail told him. The water finally finished boiling and the shrill whistle of the kettle on the stove filled the air. As Geralhd got up and served the tea, everyone continued to discuss the goblin problem. Eventually, Tannin agreed to accept a pair of goblins from Blacknail. With that decided, Blacknail and Khita excused themselves. Geralhd had promised to give Blacknail some cheese when they stopped by on their way out of the village, and they had finished their tea, so there was little point in sticking around. They still had to go track down Joan and ask her a few questions for Scamp and Imp. “Er… I’m ten,” the hobgoblin answered him. That was a good age for a human right? “You’re ten?” Tannin repeated in disbelief. Uh oh, he seemed suspicious. Was that too low? “Ten and a half?” Blacknail suggested. “Ha ha, Blacknail is such a joker,” Geralhd laughed. His laughter was awkwardly loud and there was a stiff smile on his face. “Get out of here and let me talk to Tannin,” he added as he motioned for Blacknail to leave. The hobgoblin immediately did as he was told and fled. Once outside, Blacknail and Khita headed towards where they had met Joan during their last visit, and the sound of little footsteps followed them. They passed by a few villagers as they walked and Blacknail gave them polite nods. When they got to their destination, Joan wasn’t there, so Khita went to find her while Blacknail waited. “Hello again, Mr. Blacknail. How can I help you?” Joan asked when she arrived alongside a proud looking Khita. The young blonde woman was wearing a long homespun dress and there was a polite but curious expression on her face. “Um…” he mumbled aloud to buy time. Thankfully, he didn’t have long to wait. Ferrar appeared from behind the corner of a nearby building. The little goblin looked extremely excited. He practically bounced as he ran over to join the conversation. 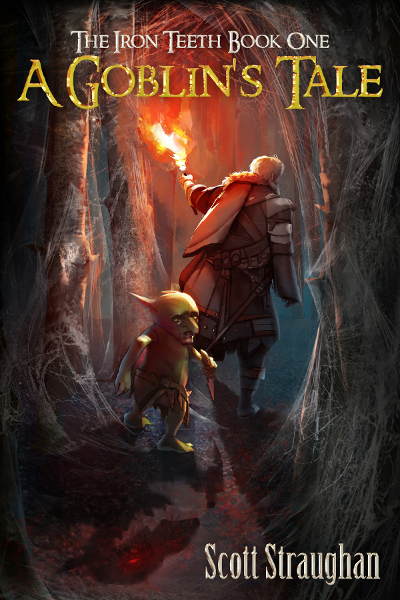 “Ask her about the color of clay matters, sometimes it goes black,” the goblin suggested as he grabbed Blacknail’s pants and looked up at the hobgoblin with wide eyes that shone with excitement. “Does the color of the clay matter? Sometimes it’s black?” Blacknail repeated uncertainly at Joan. There was no immediate reply. The blonde girl studied Blacknail and the goblin for several long seconds. She was squinting at them, and she seemed unsure of something. “Is the goblin asking the question? I think that’s what I just heard,” she asked in disbelief. This called for some skillful evasion of the truth. “Yep, he is the same, and his name is Scamp,” Blacknail replied cheerily as he nudged Ferrar with his foot. The little pest had better play along. “I’m Scamp and I’ve visited you before. That happened,” Ferrar quickly agreed as he nodded along enthusiastically. He was a smart little pest. Ferrar left Blacknail’s side and wandered over to Joan. The young woman continued to stare at the goblin suspiciously, but she didn’t back away. Ferrar began to ask her question after question and she answered them one by one. Blacknail and Khita hung back and tried to look interested. It was hard. Making clay pottery was apparently much more complicated than Blacknail had thought. After talking for a few minutes, Joan led Ferrar inside of a shed and showed him around. Ferrar kept up his barrage of questions as they walked past several shelves. They stopped in front of an oven for few moments and Joan opened its door to show Ferrar. Blacknail peered inside as well, but it was empty and boring. Could they leave now? “Alright time to go. We have important things to do,” Blacknail announced after a few minutes. He’d had enough. Looking at the oven had made him hungry. “I’ll come visit you again!” the goblin told Joan as he smiled happily. “I look forward to it,” Joan replied. She still didn’t seem to know what to make of the goblin and his questions, so she just smiled back politely. With their farewells complete, Joan left to walk home and Ferrar disappeared. The goblin couldn’t leave by the front door with them and had to sneak out. That left Khita and Blacknail alone again. “Let’s get out of here before we run into one of the old ladies that live here. I swear the hags have nothing better to do than bug me,” Khita complained as she turned to watch the street. She looked in both directions as if she was afraid someone was trying to sneak up on her. On the way out of the village, they stopped by Geralhd’s again. Blacknail still needed to pick up his cheese. By this time, Tannin was gone and Geralhd met them at the door. “Here you go. Someday soon I think I’m going to have to check out this base of yours,” Geralhd remarked as he handed the package of cheese over to Blacknail. It smelled like a good batch. He could tell because, it burned his nose when he tried to sniff it. “Er… you can’t do that,” Blacknail told him as he tucked the precious bit of dairy away in his cloak. Geralhd didn’t know about Elyias or the horde of goblins there. “Why not?” Geralhd asked. The quick reply had made him curious. “It’s… a secret?” Blacknail muttered uncertainly. The cheese fumes were still clouding his brain. He was still seeing flashes of color. A grimace appeared on Blacknail’s face. It sounded dumb when Geralhd said it like that. “There’s a huge wolf pack in the area. They’ve been acting aggressively so it wouldn’t be safe,” Khita added. “Ya, that,” Blacknail agreed. How was Khita being so helpful? She had covered for him several times. It was weird. The hobgoblin scratched his nose. Maybe he was just having an off day? “Oh, well take care of yourselves,” Geralhd told them. At the first sign of danger he had completely changed his mind about joining them. “We’re not afraid of any wolves,” Khita replied confidently. Blacknail didn’t agree with her. He was tactically cautious about anything larger than him that wanted to eat him. After saying their goodbyes, Blacknail and Khita headed out the village gates. They crossed the fields and met up with Ferrar and the other goblins, who were waiting for them. Well, one goblin was missing, but Blacknail was sure it would show up later, or not. The important thing was that they had accomplished their mission. “Did you learn what you wanted to?” Blacknail asked Ferrar. “Yep, I know many new things about fire and clay! I can burn more now,” Ferrar replied eagerly. “Did you learn how to cook or make better food,” Blacknail asked suspiciously. That was the reason he had agreed to let Ferrar come along. “Um, yes. I learned about ovens,” the goblin replied carefully. “Good. Good,” Blacknail muttered as he turned away. He had gotten his hands on cheese, new ways of cooking, and convinced the stupid humans to let goblins inside their village. Things were looking up. My first book has been out on Amazon for a while now, but I still need reviews. Every review helps me gain publicity, so please write me up a quick one. Thanks so much. And thus begins the goblin takeover. I do not mean to insult the author but it has been a very slow week for any kind of story. Thanks for all your hard work, great chapter! I laughed a lot with that one! Thanks for the chapter!! Not sure if a typo or an accent, but in case its a typo. "I heard you had some guests a visiting" > "I heard you had some guests visiting"
Proper empire need trading yep. Do goblins go into withdrawal if they don't do crazy stuff often enough?